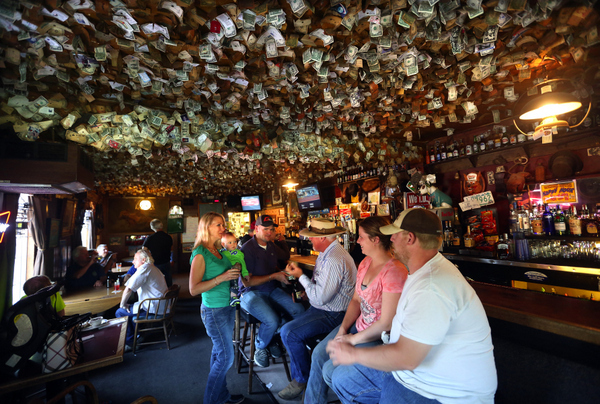 Thousands of faded business cards and dollar bills cover the ceiling of the Washoe House bar. There are roadhouses, and then there is the Washoe House on Stony Point Road at Roblar Road. Just walk in the front door and look up. The ceiling of the long, narrow room is thickly papered with history: business cards, photographs, notes, doodles and money, mostly dollar bills. Waitress Andrea Smith believes the tradition of fastening money to the low-ceilinged bar area dates back to the Washoe House’s earliest days. Emily Drew, granddaughter of the owner, serves up traditional American meals a the Washoe House. 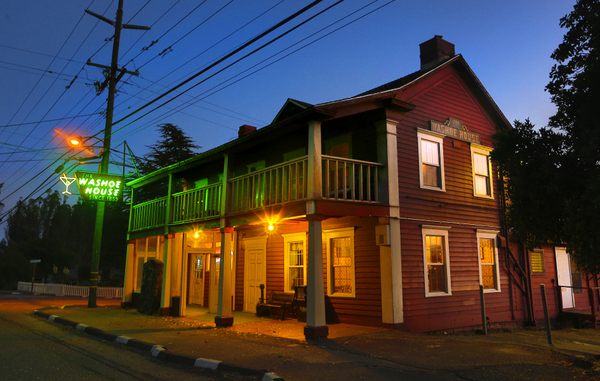 The building was constructed in 1859 as a stagecoach stop on the road from Petaluma to Santa Rosa, just a decade after Americans began streaming west, hoping to strike it rich in California’s gold fields. But just in case, when those early patrons came in, “they’d put money on the ceiling so when they came back, if they needed it, there’d be money,” she said. Even though the Gold Rush is now ancient history, the tradition remains, carried on by the motorcycle riders who regularly stop in to refuel and other loyal customers in need of a burger and fries. Before becoming a roadhouse, the building housed a butcher shop and a post office. It was considered picturesque enough to appear in “True Crime,” a 1999 film starring Clint Eastwood. It’s still picturesque and filled with history, which is part of the appeal. Patron Jeremy White, dining here recently with Rachel McKee, said his family has been coming to the Washoe House for many years. 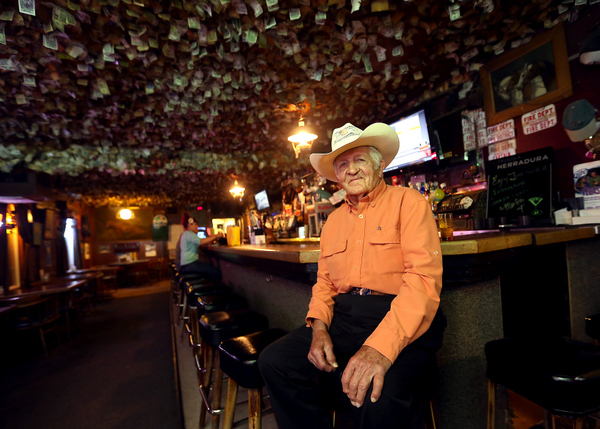 Dennis Drew said his mother and late father, Bill Drew, have owned the watering hole for more than 35 years. Though he’s not very involved with the business, his daughter Emily works there now. Bar patrons Paul and George, who declined to give their last names, agreed it’s a friendly place. Paul and George are regular customers of Smith’s. The waitress is a sixth-generation Petaluman who said she grew up coming to the Washoe House before signing on as an employee. Ron Goodlund, 89, owns a farm a few miles up the road from the Washoe House where he has been a regular for 65 years. The Washoe House. “I remember when I was 4 years old, sitting at the bar. Now my 8-year-old daughter is coming in here. It’s tradition,” she said. In a place as venerable as the Washoe House, are there ghosts? Other rumors are more persistent. Some say that a bawdy house was located upstairs. Others claim that Ulysses S. Grant gave a speech from the building’s balcony while naked, drunk and on his way to patronize the upstairs establishment. While the latter is a dandy story, Penngrove-based local historian Chuck Lucas is convinced it didn’t happen. Fortunately, Lucas has another story about the building that is true. During the Civil War, Petaluma sided with the North, Santa Rosa with the South. In 1865, following the April assassination of Abraham Lincoln, he said, a group of Petaluma militia set off for Santa Rosa, “possibly to take back the county seat but more likely to trash the offices of the Southern-sympathizing Santa Rosa Democrat. They traveled the dusty stage road leading to Santa Rosa that is now Stony Point. One drink led to another, and the next morning the men’s wives set off for the Washoe House to take their hungover husbands home to Petaluma. The only thing killed in the Battle of the Washoe House were large quantities of ale,” Lucas said. The Washoe House is located at 2840 Stony Point Road, Petaluma, 795-4544. The Washoe House was built in 1859 as a stage coach stop between Santa Rosa, Petaluma and Bodega.